I first became interested in my genealogy in the mid 70s but numerous career transfers necessitated putting this idea to one side for a number of years. Finally, in 1989, I was in a position to make my very first trip to Scotland, land of my forefathers, my father, Andrew, having been born in Dundee, in 1905. He came to Canada, along with his older brother, David (1903), both having been, essentially, orphaned in 1920. They subsequently earned enough money to bring their younger sister, Jessie, to Canada to join them in Brantford, Ontario, where they were raised to adulthood by their uncle and aunt who had previously emigrated to Canada from Dundee. The result of my 1989 trip to Scotland was an instant desire to learn more about my father and I entered into the realm of genealogy. During the years that followed, I was quite successful in documenting my family tree all the way back to 1750, in the vicinity of Airlie, where my 4x great grandfather was born. However, there did remain one dangling branch, that of my grandfather, Arthur Rattray, born in 1871, in Dundee. He left Dundee in early 1908 to be employed as chief steward aboard the SS Moeraki, owned by the Union Steamship Company, of Dunedin, New Zealand. For whatever reason(s), he never returned to Scotland, abandoning my grandmother, my uncle David, my father, Andrew, and their sister, Jessie, who was born some four months after Arthur left for New Zealand. So, the challenge presented itself, what happened to my grandfather? In the ensuing years, I trolled numerous genealogy websites, cemetery records, any kind of record that I could find, without success. In November of 2007, Ancestry.com added a new free database, Australian Electoral Roll 1928. I searched and found an Arthur Rattray, 338 Liverpool Street, Hobart, Tasmania, Chief Steward! Could it be him? All the indicators were there. This Arthur also had a wife, according to the Australian Electoral Roll. My next step was to send a query to the genealogy help group for Tasmania. Very quickly I received an email response from a Suzanne Griffin, not a relative, but offering to look into the matter. 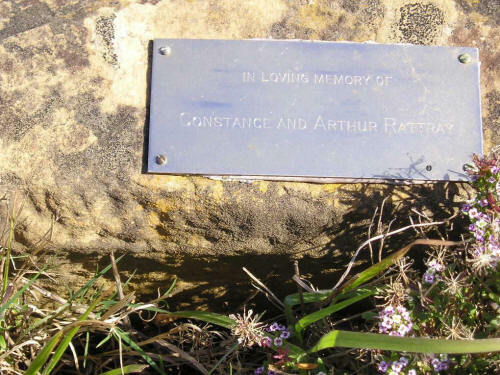 Over the next few weeks, she came up with the 1922 marriage record between this Arthur and his wife, Constance. In tracing Constance's line, Suzanne determined that she was either widowed or divorced, having been married once before. In the process, Suzanne telephoned a relative of Constance, she having died in 1950, the relative confirmed that Arthur was, indeed, Scottish. The next step was to examine the actual marriage certificate for Arthur and Constance and behold! His parents were correctly listed as David Rattray and Isabella Will, my great grandparents! Suzanne subsequently sent me a photo of the grave marker for Constance and Arthur and will shortly send me a copy of his death certificate. For those indulging in genealogy I guess the lesson is, never stop looking......you may just find what you are looking for. Needless to say, I am sending a Christmas flower arrangement to Suzanne in thanks for her Christmas present to me. Attached is a photo of the grave marker, sent to me by Suzanne, which begs the question, who arranged and paid for this marker? Today, there are four separate Rattray listings in the Hobart telephone directory (a city of 200,000). The next step is for me to contact these four households. Although Arthur was 51 and Constance 44 at the time of their marriage it is possible they had descendants.